Spring time is here and its a great time to propagate your plants. 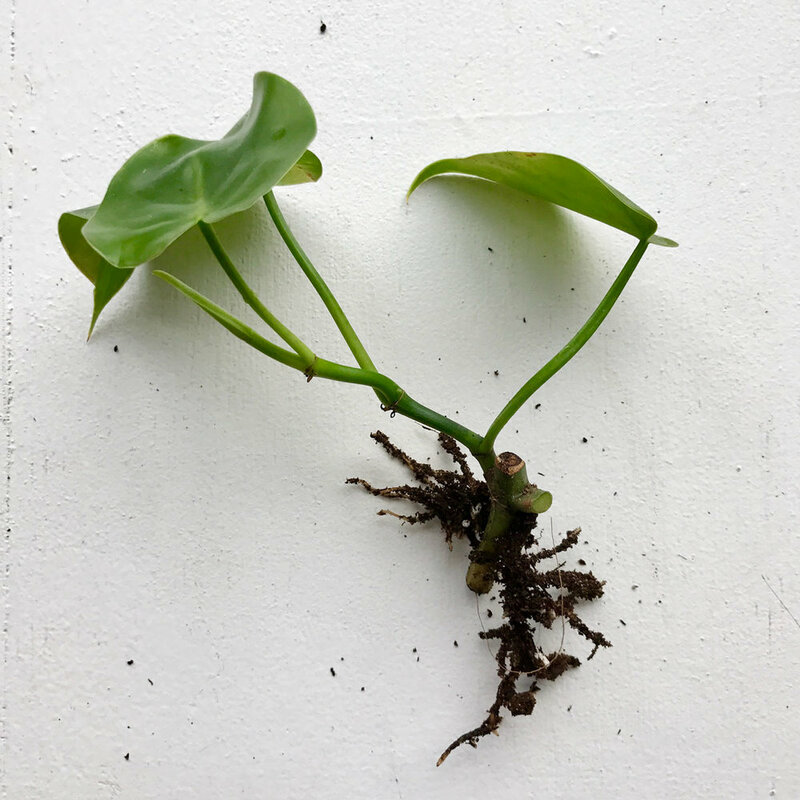 We will show you how to take cuttings from your Heart Leaf Philodendron. 1. 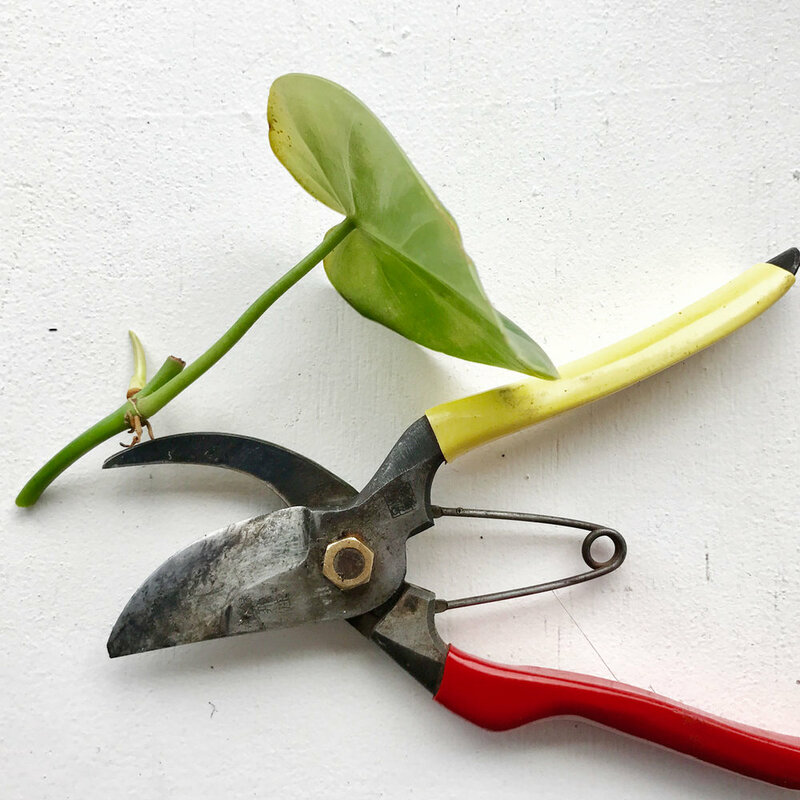 Take a 5-10cm cutting from your healthy plant ensuring that you cut below a node, as this is where the roots grow from. 2. Leave the cutting in water in a warm spot, but not in direct sunlight. This should take a few weeks before roots begin to grow. 3. Once roots have formed plant this in a well drainingpotting mix. We like to add some play sand to our mix to help with drainage. 4. Choose a position for your new plant in a well lit space, but not in direct sun. Water when top soil is dry. If you haven't been following us on instagram and keeping up with our weekly plant tips you can also find them here. We collaborated with Adelaide based ceramicist, Katia Carletti to make an exclusive limited run of planters. Katia makes all of her work using a hand built, pinching technique from her home studio. Together we designed a range of desk planters and wall hanging planters, combing ceramics and steel. With our face paced lifestyles, stress, bad diets, over prescribing of antibiotics we have created the "germ-free" environment. Increased chemical/synthetic fertilizers used in farming, and everyday toxins have all begun to take a toll on our gut health. Research is showing that our gut bacteria is less diverse that what is has been previously , which could be a direct link to the increase in so many chronic health conditions. Tips on introducing fermented foods into your diet? Chop all your cabbage up - reserve the outer lay leaves in tact if possible. In a big mixing bowl - place a layer of cabbage (roughly two handfuls) and sprinkle some salt over. "Massage"/ crunch all the salt over the cabbage. Repeat this process with all of your cabbage to pull the water out of the cabbage. When you have completed this you should be able to squeeze a handful of cabbage and water should drip out of it. Let it sit for an hour or two, squeezing it sporadically with your hands to get the last bit of the water out of it. Pack your kraut into a widemouth jar (I use the old 1L coconut oil jars) - use a rolling pin to bash in down as you go to pack it all in tightly, you don't want to have any air pockets. You want to leave about an 1inch headspace at the top of your jar. Ideally, you should have pulled enough water from the cabbage to ensure all the kraut is submerged however you might need to top it up with salt water brine (1 cup of filtered water to 1 tsp of salt). When you've packed it all in to jars, cut the outer cabbage leaf to the size of the top of the jar and use it as a seal - you want to keep all the cabbage beneath this, inevitably you will get some floaties which is OK but the more contact with air the greater chance for spoilage. Lastly - once you have packed it into the jars, sealed it with a cut-to-size cabbage leaf, then you need a weight to assist with forcing the water out and keeping the cabbage submerged. I usually use a smaller jar filled with water to do this BUT if I have used smaller jars then I just push down the kraut twice a day with my CLEAN fingers. Once you have put your weight on, cover the kraut with a tea towel and place out of direct sunlight in your kitchen. After the first few days you will notice bulk bubbles appearing - this is a great sign that its fermenting smile emoticon Push down on on the kraut during this time to get any trapped gases out. Leave it sit on your bench for 1-4 weeks - the hotter your kitchen the less time required the colder your kitchen, the longer fermenting time frame. A white film/scum might develop on the surface - just skim it off, its a yeast that forms due to air exposure, your ferment underneath will be perfectly fine. Floaties - try skim these out as the can cause mould/spoilage. Kokedama is a traditional Japanese art form that uses moss as a container for a plant. They are a great way to bring some greenery into your home. Herbs work really well in these and are great to hang in the kitchen. Be sure to choose a plant that suits the environment in which you plan to hang the ball. STEP 1. Shake the soil from the plants, being careful not to disturb the roots. STEP 2. 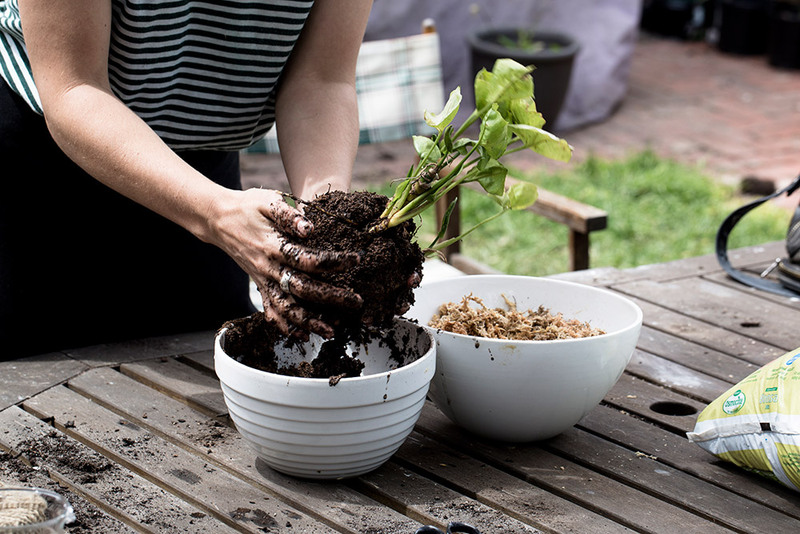 Mix water, peat soil and bonsai soil until the soil is wet enough so you can mould it to achieve a ball shape, which is larger than the root ball of your plant. STEP 3. 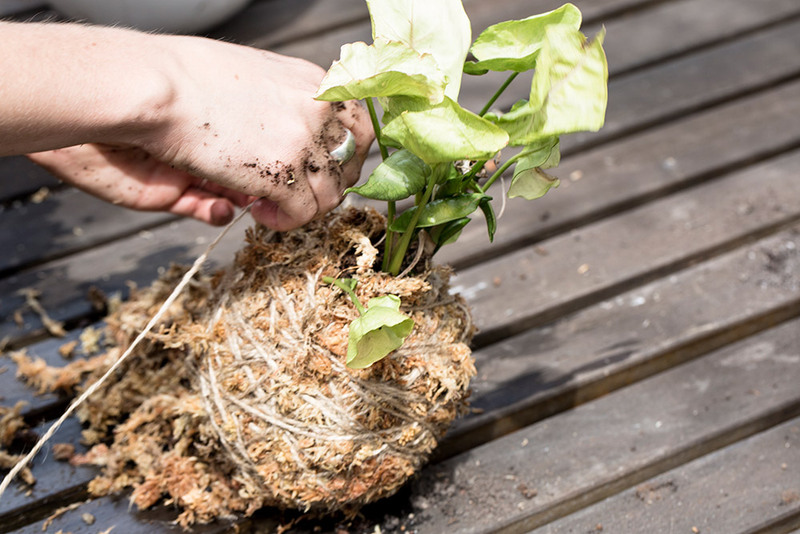 Make a hole in your ball to fit the roots of your plant or pat soil around the roots to form a ball. STEP 4. Make a small square of moss on a flat surface and place your ball in the middle. Keep adding moss around the ball and wrap with string. It’s a little tricky holding it all together, but the aim is to keep adding moss and wrapping the twine around your ball until you achieve a round shape. Cut the string once you have made a round ball. STEP 5. Re-attach some loose string and knot it on either side to create the ‘hanger’. Hang it up in a space in your home. Maintenance Tip: To keep alive remove the plant from its hanging hook and soak in a bucket of water two times a week for half an hour.